Who lives here: Builder Carl Christianson of G. Christianson Construction; his wife, Julie; their son, Gale, 5; their daughter, Ruby, 3; and their yellow Lab, Daisy. They are expecting another child soon. The photovoltaic panels atop the garage and front porch are a clue that this new-build Oregon house is no ordinary home when it comes to energy efficiency. 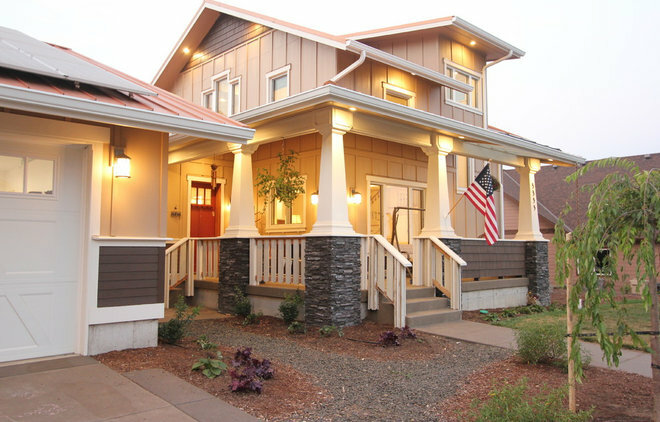 “My wife Julie and I wanted to demonstrate the advantages of passive house concepts that I was learning about to our community and the other builders in Corvallis,” says builder-homeowner Carl Christianson. The couple also wanted to make this their family’s forever home. Style. 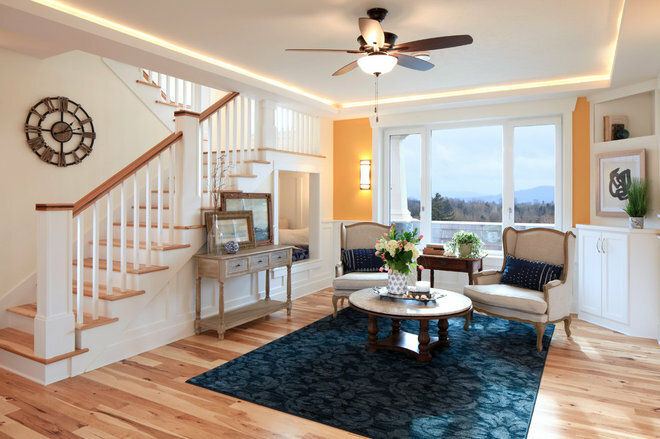 A contemporary take on Craftsman style with some nautical flourishes. Exterior. The front of the house faces south. Overhangs allow in sunlight during the winter and shade the rooms from the sun’s heat in the summer. The porch has a swing and a table for messy food projects they enjoy doing with their kids, like canning fruit picked from the backyard. The exterior is clad in Hardie board and the roof is standing-seam metal in a copper color. The gutter system feeds into cisterns. This meant creating efficient and multifunctional spaces, planning smart built-ins to help them organize their busy lives and building a smaller space that could achieve Passive House certification and building sustainably. To make sure they could age in place, they put the master suite on the first floor. “We wanted to focus on quality features, not large empty spaces,” Carl says. Getting ready to build a Passive House took a lot of prep work. “We looked for the perfect plan but couldn’t find it,” Carl says. “So we read about Not So Big House ideals — in particular we studied Ross Chapin and the style of his Northwest coastal cottages on Whidbey Island. We then took our ideas to the only Passive House architect we knew of.” That was Jan Fillinger of Studio-E Architecture, who brought their vision together while adding his expertise. Carl and his team completed Certified Passive House Builder training in Denver. Then he and Julie looked through Houzz for style inspiration. This Craftsman in Wilmington, Delaware, gave them ideas for the exterior. 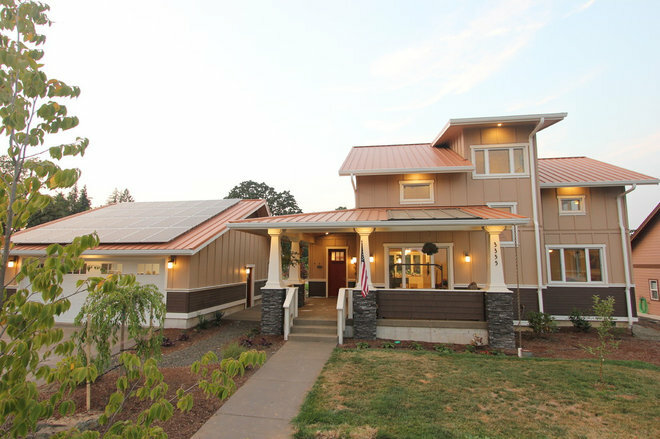 The result: Their home was the first certified Passive House in Corvallis and their net energy usage is zero. The only energy bill they pay is $11 a month to be connected to the grid. This saves the family about $1,740 a year. Any excess energy they produce earns them credits they donate to a fund that helps pay for heat for families in need. Entry. One of the big not-so-big-house ideas the couple embraced in the design is dual-purpose spaces. Rather than entering a foyer, the front is a hardworking space that serves as a mudroom and landing station. “We wanted our kids to have a place to put everything when they walk in the door and get in the habit of doing so,” Carl says. “And I think any exterior door in this region needs a tile landing because our shoes and boots are wet so often,” he says. A porcelain tile floor in a slate color takes care of that, while cubbies for shoes, coats, bags and baskets for mittens, gloves and scarves give everyone in the family plus one guest their own space for outerwear. A 5-foot bench provides a spot to take off and put on shoes. Interior style. 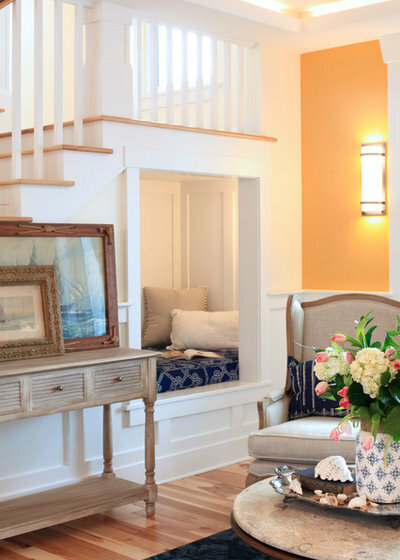 In addition to Craftsman and Mission-style inspirations, studying Chapin’s coastal cottages gave Julie the idea to add nautical touches to the home. 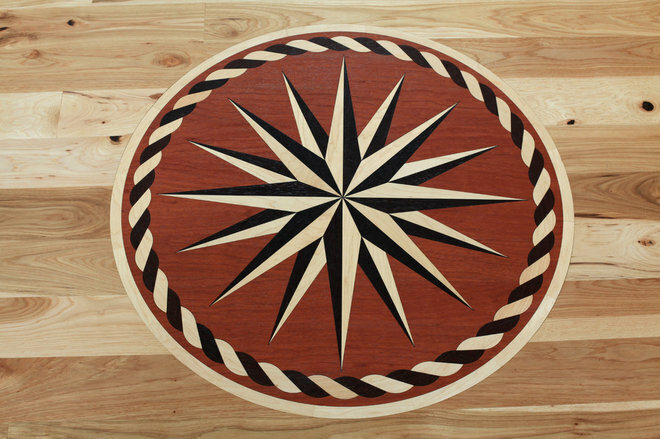 This wood inlay compass rose sets the tone between the entry and the living room. Carl used his old Boy Scout compass to make it point true north. Kitchen. 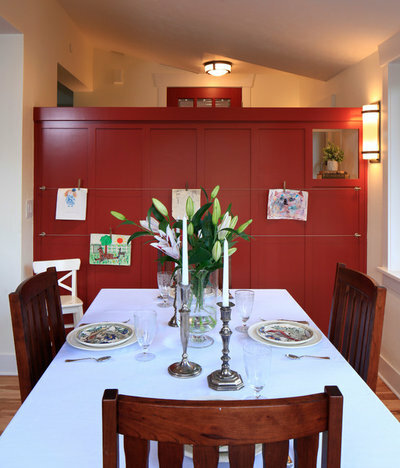 This Seattle Craftsman the couple spied on Houzz inspired some of the color scheme and millwork, including these columns flanking the wide opening between the living room and the kitchen. 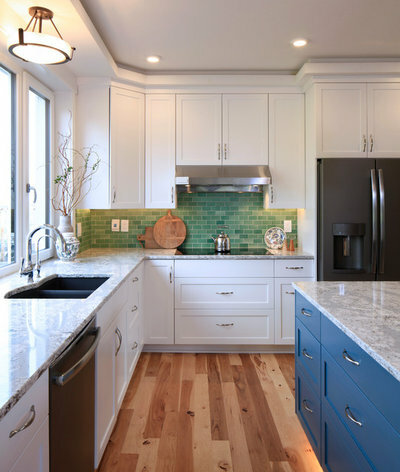 This kitchen inspired the color scheme and introduced them to the backsplash tile they used. Lighting. 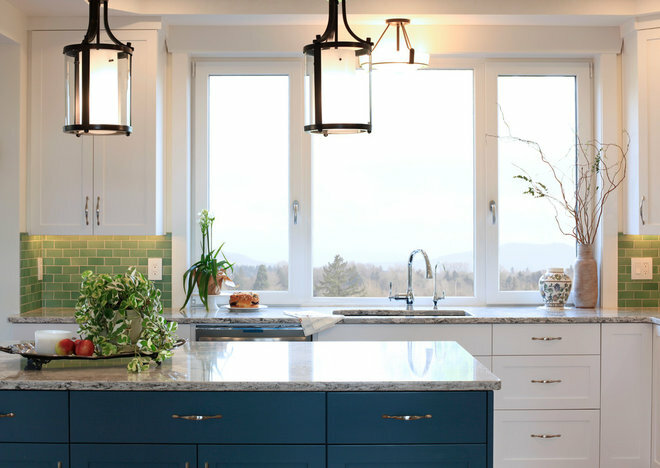 Large windows over the sink let in the daylight, and their tilt-and-turn functionality lets in the fresh air. 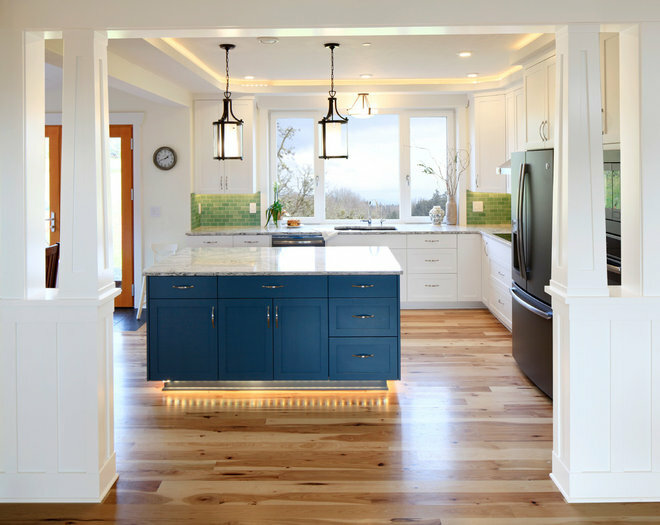 And the lighting underneath the kitchen island, under the cabinets and in a recessed cove in the ceiling are Phillips Hue LED tape lights that can change color via an app. Layout. The kitchen has a functional work triangle that gets some help from the island. The major appliances are concentrated on the wall to the right, surrounded by white Shaker-style cabinets. The dishwasher is next to the sink, and the island serves as a landing zone for prep work, ingredients and groceries. Flooring. The floors on the first floor are character-grade hickory, full of variation in color and knots. They used Trace of Nature Marmoleum by Forbo in the utility areas. “We did not put down any carpeting in the house because it’s not good for allergies,” Carl says. Upstairs they used luxury vinyl tile that looks like wood for a fraction of the cost. Island. 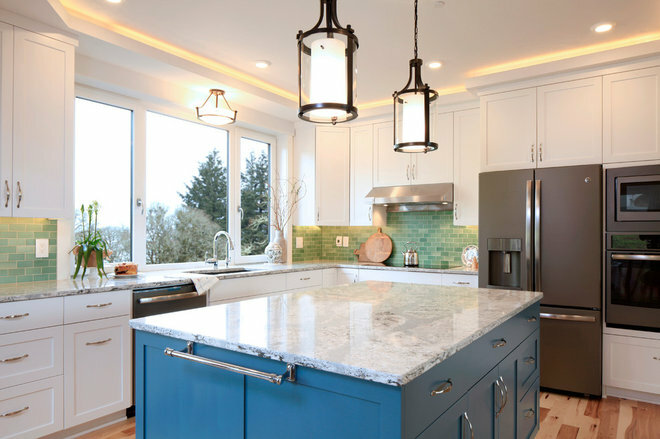 The island includes extensive storage and brings in the blue color. Large LED lanterns illuminate this workstation. Countertops. 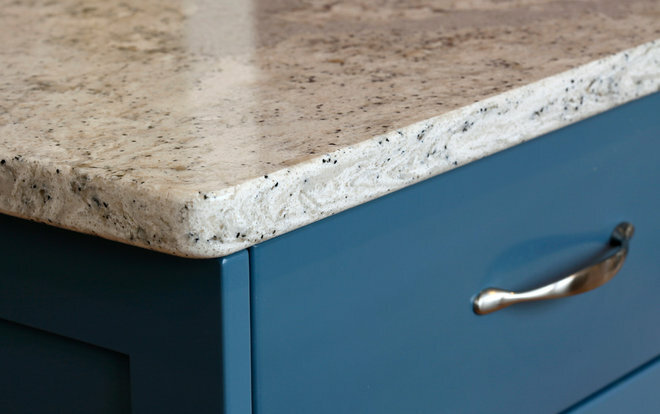 The quartz countertops have veining with flecks of blue and green in it. “It will last a lifetime,” Carl says. Backsplash. 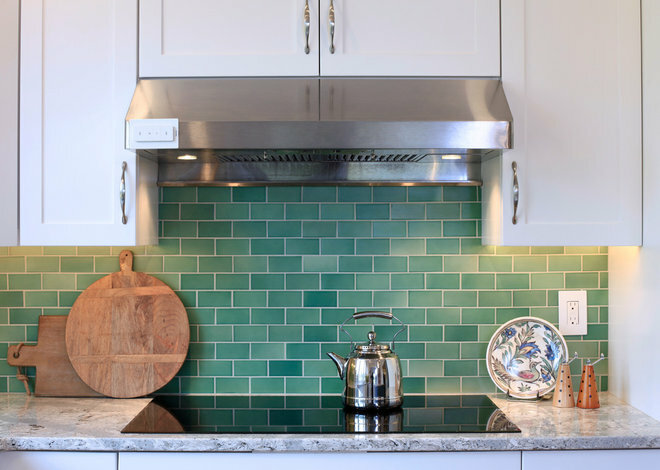 The backsplash is handmade tile from Heath Ceramics. It is two-by-four-inch subway tile in Meadow Green. Range. The range is an induction stove. The entry cubbies are on the other side of the red-accented partial wall, and there’s a peep-through on the top left so those coming through the front door can catch a glimpse through to the backyard. 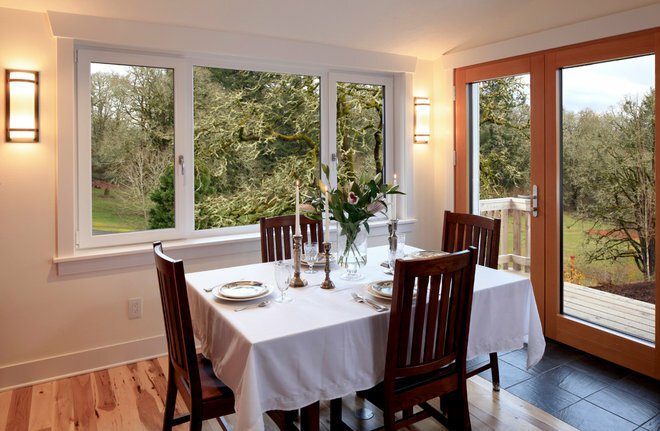 Large windows and glass doors out to the backyard bring daylight into the dining room. They are all triple-paned and the door is clear vertical grain fir. “Even on a cold day there is virtually no temperature change when you are leaning against the glass,” Carl says. More slate-colored porcelain tile beneath this entry will stand up to soggy boots. The backyard is not just a visual feast, it’s full of edible plants. 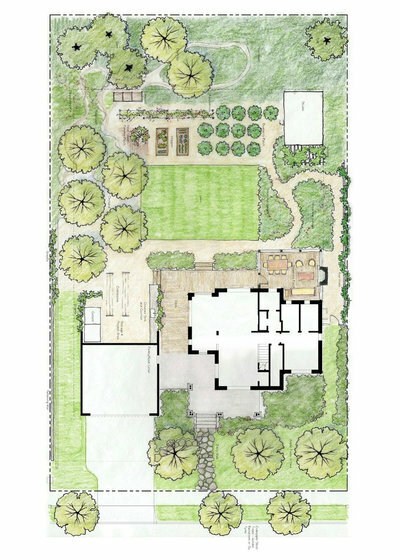 Here’s the landscape plan from Lovinger Robertson Landscape Architects. Plants include peach, apple and cherry trees, raised vegetable beds, blueberry bushes, herbs, archways for pea vines, trellises for kiwis and grapes and more. Laundry room. 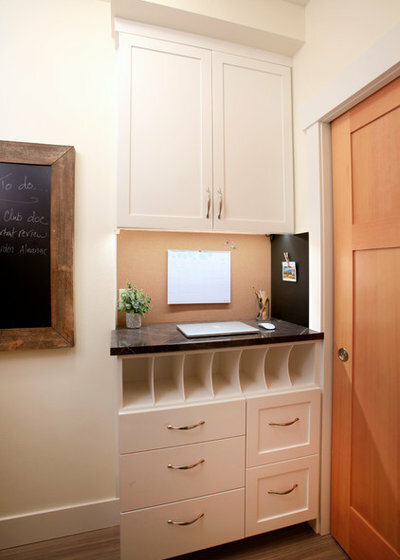 Much like the entry, the laundry room has handy built-ins that help keep the family organized. This area has a command central station with corkboard for schedules, slots for mail, room to charge devices and drawers for storage and organizing. Living room. 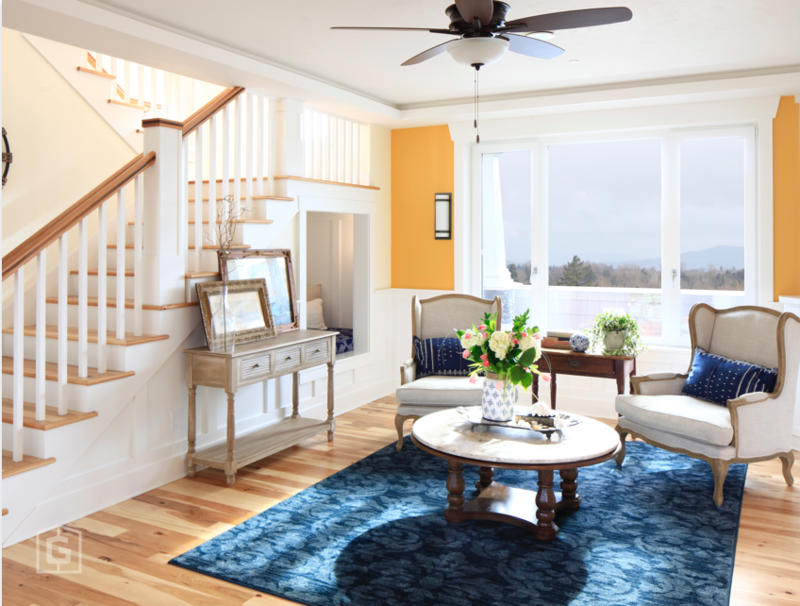 A large fixed window and glass doors bring natural light into the living room and provide access to the front porch. The room has a tray ceiling with a cove for LED lights that can change color in concert with music or whatever they are watching on TV. “We like it in orange and black when we’re watching Beaver football games,” Carl says. This room was staged for the photo shoot before the family moved all the way in. Now there’s a TV in the right corner where you see the painting, with room for all the electronics in the cabinet below it and a sofa big enough for the whole family facing the TV. Reading-napping nook. The living room has a special feature inspired by Ross Chapin’s cottages. 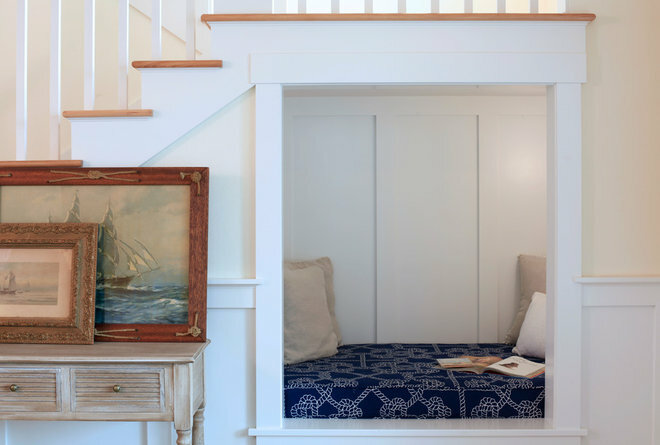 A reading-napping nook takes advantage of the space under the staircase, which is often wasted. Fillinger offset the staircase to provide enough length and height in the nook for an adult to fully lie down and take a nap. Outfitted with Craftsman-style millwork, lighting and a cushy mattress, it’s a favorite spot for the kids to hang out or have mom or dad read to them, or for anyone in the family to sneak off for a nap. Julie found a nautical fabric to cover the custom foam cushion. First-floor plan. 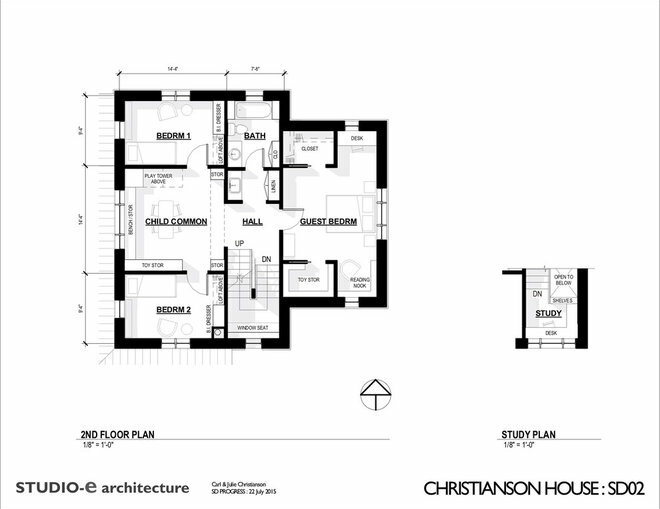 Here you can see how all of the rooms flow together, with the master suite located off to the right with a zone of staircase, laundry room and utility room creating some privacy between it and the public spaces. The compact nursery off the master suite will serve them well for nighttime feedings after their baby arrives. The space is transitional and can serve as a future office or sitting room. Staircase. 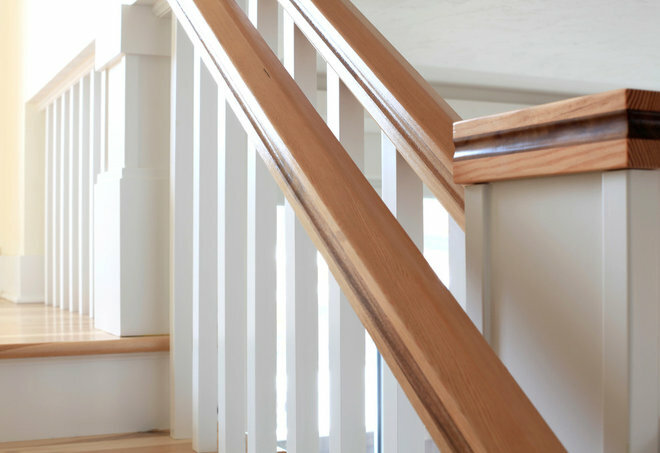 The posts and handrail on the staircase nod to the kinds of carpentry details seen in a Craftsman-era home. The railing is a clear vertical grain fir on the top and bottom with black walnut in the middle. This was accomplished by sandwiching the three pieces together, laminating them and then using a router to create the recessed detail. Master bathroom. “This master bathroom is tight to save space,” Carl says of the 6-by-7½-foot room. 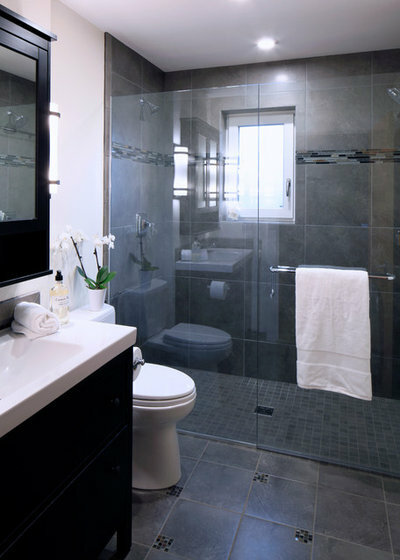 By using clear glass on the shower stall and adding a shower window, he was able to make it look more expansive. Using a single-sink vanity helped save space. A tilt-and-turn window lets in the natural light in the daytime and provides ventilation. The clear shower enclosure lets the natural light steam through to the entire bathroom. Second-floor plan. Here’s a look at the floor plan upstairs. Julie and Carl chose to shrink the upstairs bedrooms to make room for a playroom with a vaulted ceiling for the kids. To the right of the plan you can also see that they added a landing at another half-story up for an office nook with a view. Guest bedroom. 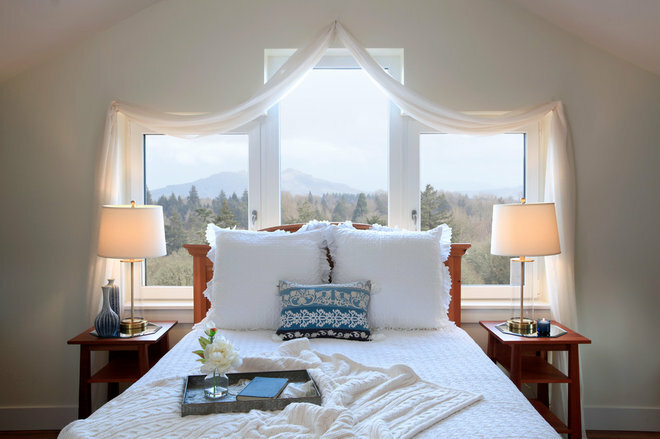 More triple-glazed tilt-turn windows light up the master bedroom, which has views all the way to Mount Washington. Carl Christianson and Tanner Wood of G. Christianson Construction were on hand to talk about sustainability in the building trades. G. Christianson Construction is proud to be a partner in the Amy's Trail collaboration. More accolades for the Christianson Passive House! 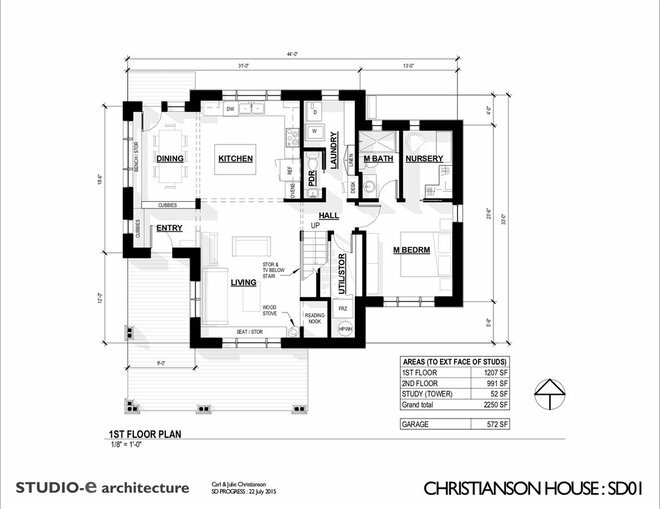 The Christianson passive house was published in Green Building & Design Magazine! Surrounded by his loved ones, Gregory (Greg) Wynn Christianson passed away peacefully at home on May 27, 2017, after a courageous battle with cancer. Ready to start a project with us? All projects begin with a custom estimate based on your needs.